GREENTIPS by the American Society of Heating, Refrigeration and Air Conditioning Engineers, details can be found in the ASHRAE Green Guide. 31. Follow ASHRAE guidlines for your energy audits. They are comprehensive and provide tactical leadership for your energy and water conservation program. 33. Go Carbon Nuetral through NativeEnergy or Bonniville Environmental Foundation. Costs for Natural Gas .007 Dollars/MBTU, No.2 Oil .0179 Dollars/MBTU, Electricity .0362 Dollars/MBTU. September 2009. Use duel fuel burners for heating and only offpeak electricity for heating(watersource heat pump systems)and air conditioning with Ice Thermal Storage Systems. Install 4-T-5 lamps and 1-effecient balast in fixtures with prizmatic lenses in lieu of 400 watt High Bay light fixtures. This can be applied in gymnasiums and warehouses and possibly factories. Add integral occupancy sensors on the fixtures and really cut your costs. Install T5 lighting systems in offices,schools and any other building type that has old T12 lamps and magnetic ballasts. Take advantage of free cooling by installing Economiser Systems. Take the bull by the horns and hire an ESP, ESCO or EEC from the accredidation list of NAESCO. Buy your fuel and elctricity from your ESP. Follow the Massachusetts Energy Code and relevant ASHRAE standards for existing construction and new construction (ie Std 100-2006 Energy Conservation in Existing Buildings, Std 90.1 - 2004 Energy Standard for Buidings except Low Rise Residential Buildings, Std 90.2 - 2004 Energy Effecient Design of Low Rise Residential Buildings). Buy and read the the ASHRAE (American Society of Heating, Refrigeration and Air Conditioning Engineers) Green Guide for more water conservation and energy efficient systems advice. Take advantage of Tax Breaks and Rebates for retrofits and new construction of energy and water conservation products. Install low consumption one piece toilets. Example would be the Toto Ultra Max One Piece Toilet, 1.6 GPF,min water pressure - 8 psi, www.totousa.com. There are Duel Flush toilets now which provide even more savings but you might have to install oval piping on " horizontal "pipe runs. Install water source heat pump systems with GEOTHERMAL Loops in buildings with adjacent ponds or available ground locations. The EER can go up to 36. See www.mcquay.com. Install Geothermal Heating and Cooling Systems using standing wells. Wells will be 1500 ft deep and supply water at 52 degrees. Install Photovoltaic Solar Energy System, 3.5 kw system size (typical residential system), cost is $ 27,000.00 F&I, federal tax credit is 30% of system cost or $2,000.00 max, state tax credit is 15% of system cost or $ 1,000.00 max, state tax exemption and state property tax exemption for twenty years, MTC Grant is $ 12,500.00, Final cost is $ 11,750.00 F&I. Payback is approximatly 10 years. Install Solar Domestic Hot Water Systems. 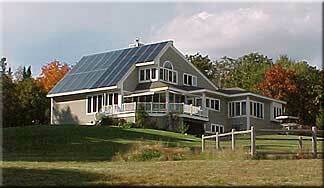 The payback period for Residential Solar Domestic Hotwater systems is between 5 and 10 years. Example - System cost $6,600.00(three panels)tax credits state $990.00, tax credits federal $1,980.00,hot water cost/yr $325.00/yr - $ 1129.41yr,the lower cost is for natural gas and the higher cost is for electric, 40% savings for solar system in the winter and 100% in the summer. Projected inflation of fuel costs could range between 10 % and 25% per year. This data is for Massachusetts. Replace old refrigerators in apt buildings. Install smaller energystar models. Buy in bulk to reduce purchasing costs.Refrigerators consume the most electricity in apt buildings which have gas or oil heating systems. Install water pressure reducing valves. These save water and reduce costs. Maintain twenty psi at the top floor. Control the pressure at each floor if possible. Support Wind Power Systems Installations. The cost for a KWH of electricity produced by Wind Power Sysytems will be 3 cents per kwh by 2012 ( for class 4 winds). 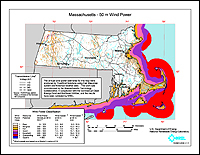 Wind maps point to the area around Cape Cod for excellent to outstanding wind resources.